PPS also only requires a short construction timeframe. Compared to traditional pumping stations, PPS is produced in the Grundfos factory and sent to the site as a complete package, making installation easier. This reduces installation time by as much as 80%, ensuring minimal disruption to people and infrastructure. With over 40 years’ experience globally, Grundfos’ PPS solution has demonstrated its highest quality and effectiveness in several projects for various applications in Southeast Asia, such as collecting and transporting wastewater in sewage systems in Bali, Indonesia. Outside of Southeast Asia, China has over a thousand installations of PPS to address the high demand resulting from the country’s fastgrowing urbanisation, for various applications including sewage pumping, drainage and flood control. Leakage-proof Not leakage-proof due to cracks caused by instable stratum. Leakage-proof from bottom to head cover. Anti-corrosion As a porous material, concrete may react with gas and acidic materials. Made from high-density polyethylene (HDPE) or glass-fibre reinforced plastic (GRP), it is resistant to chemical corrosion at a certain level. Ease of installation Built on-site, it requires coordination of several equipment suppliers and installation of equipment’s on site which is time-consuming. Additional time is also spent in concrete laying and curing work. Complete pumping station delivered based on customer requirements. Modular flexibility No modularity – each pumping station is built on-site based on conditions Modular design allows user to create customer-specific PPS by using wellproven components. Maintenance Regular maintenance checks and cleaning are required. Features self-cleaning design, which minimises the risk of hydrogen sulphide creation, odour problems, and clogging. Grundfos is a global leader in advanced pump solutions and trendsetter in water technologies. The company contributes to global sustainability by pioneering technologies that improve quality of life for people and care for the planet. Grundfos is also one of the world’s leading pump manufacturers with an annual production of more than 17 million pump units. The company provides energy efficient pumps and smart pumping solutions for various applications across diverse segments including domestic & commercial buildings, industries, water utilities (water & wastewater management) and pumps running on renewable energy. 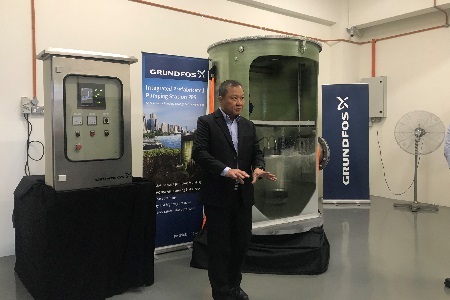 Grundfos Pumps Sdn Bhd has been selling pumps in Malaysia since the mid-60s, through an agent in Kuala Lumpur, and later incorporated in August 1990. Today, Grundfos Malaysia is housed at the Glenmarie Industrial Park in Shah Alam, with more than 100 employees from sales and marketing to human resources, administrative and accounts to production and logistic, as well as a service centre equipped with state-of-the-art testing facilities. As a customer-oriented company, Grundfos has established a strategic Dealers Network around Peninsular Malaysia, Sabah, Sarawak and Brunei to serve local customers better. 1 Emergency Events Database (EM-DAT) collected by Belgium-based Centre for Research on the Epidemiology of Disasters (CRED). Data last updated August 2018.